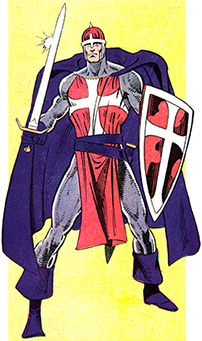 Powers/Abilities: The Crusader possesses superhuman strength, endurance, speed and agility which are all linked to his level of faith and self-assurance. With his belief at its peak, the Crusader can lift at least 20 tons and is able to survive a fight against Thor (though it's possible the Thundergod held back). 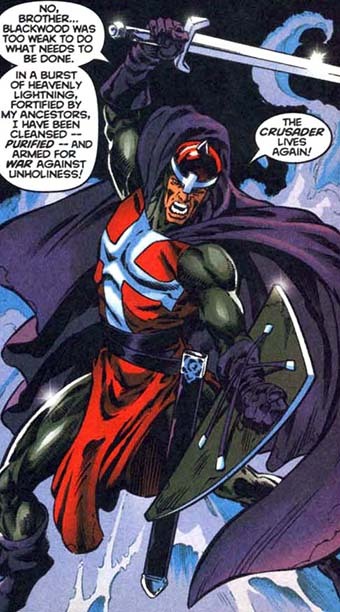 The Crusader carries a sword and shield of unknown composition that are strong enough to withstand repeated blows of Thor's uru hammer Mjolnir before shattering. The Crusader has repeatedly gathered the broken pieces of his sword to reforge it. After a recent battle against Wolverine, the Crusader has lost his right eye. (Thor I#330 (fb)) - Arthur came from a long line of Christian ancestors: priests, bishops, knights templar and theologians. His family also built Chicago's Blackwood Seminary. (Thor I#330 (fb) - BTS) - A devout Christian, Arthur became a student at his family's seminary in Chicago. His radical belief that the church should actively fight paganism like in the days of the crusades made him very unpopular. (Thor I#330) - Arthur and his fellow seminary students watched a WBBM newsreport about Thor who, after saving a girl from falling to her death, found himself being adored by a gathering of Thor cultists. Watching this pagan blasphemy thoroughly upset Arthur and he almost got in a fight with fellow seminary student Mr. Manley who preached mutual understanding. Luckily for Manley, Arthur was called aside by Father William. During a walk through the church gardens, Arthur explained to William he wished to raise the sword against those who tolerated pagans and heretics prompting to Father William saying that Arthur should reconsider his vows as he didn't see Arhur to be ordained into priesthood if he didn't let go of these extreme views. Arthur became so enraged he scolded Father William, claiming he had no need for a church of weaklings. He even slapped William, calling him a sad excuse for a priest. Father William then dismissed Arthur from the seminary and thought the man to be severely disturbed and in need of psychological help. Decided to leave Chicago, Arthur once more wanted to see his departed father in the cemetery and was let in by Mr. Polowski the gravedigger. While visiting his family crypt, Arthur experienced a religious vision of all his ancestors who had given their lives in the service of God. The spirits were angered he would even consider leaving the city, they asked Arthur if he would uphold his sacred duty as a holy warrior of the faith. After agreeing, he was bestowed the combined power of all his ancestors and named him a knight. When the religious vision subsided, Polowski discovered the knight's attire including a sword, shield, helmet and armor that had magically appeared. Arthur picked up the sword and decided to use his new might to become a true crusader. He determined to take on Thor, declaring Polowski his new squire. Arthur, now calling himself the Crusader attacked Thor in downtown Chicago where Thor was about to receive the key to the city. His presence prompted fellow believers of god to attack the Thor cultists. Pleased at the sight of believers going to battle, the Crusader leaped down from the building to attack the thunder god himself. The Crusader's strong belief powered his strength to the point he could actually lift a cab with his hands and threw it at Thor. After that, he managed to draw first blood by hitting Thor in the face with his sword. 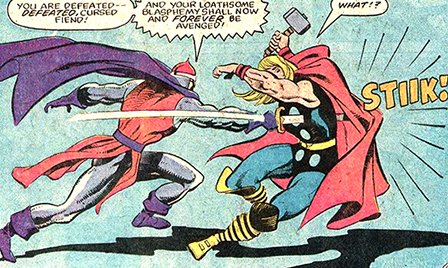 (Thor I#331) - During their battle, the Crusader managed to gain the upper hand over Thor, even cutting his arm. In an attempt to use Mjolnir on the Crusader, Thor was stunned when Crusader deflected the blow with his shield and later even by using his bare hands. The Crusader then finished the thunder god off by stabbing him through the chest. Before the Crusader could finish his enemy, Thor was rescued by Sif who returned Thor to Asgard. The Crusader and his squire walked off, the police was too afraid to intervene. Whilst in Asgard, Odin used his powers to heal Thor's wounds and return him to full strength. When asked why he could be defeated by one as the Crusader, Odin replied that it had been a battle of faith. While the Crusader firmly believed in his cause, Thor was weakened because he felt awkward being worshipped by mortals again. At dawn, as the Crusader was in a fight with Father William and the Thor cultists he was once again approached by Thor. Now with his full strength the thunder god had returned from Asgard to deal with the Crusader. During the battle Arthur noticed how the crowd was choosing Thor's side which made him question himself. This indirectly affected his powers. Thor used Mjolnir and was now able to shatter the Crusader's sword and flung the villain towards a pole, defeating him. Arthur, joined by Polowski fled the scene, filled with doubts about his cause. Polowski decided to take the Crusader to the emergency room and planned to beg the cemetery to get his old job back. (New Avengers: Most Wanted Files - BTS) - The Chicago police eventually dropped the case. (Avengers Spotlight#39 (fb)) - After putting his religious life behind him, Arthur married single mom Eleanor and adopted her daughter, Jenny. But in the two years Arthur was married to Eleanor he slowly regained his faith, convincing himself that Satan must have helped Thor that fateful day. He than reforged his shattered sword, which caused him to completely lose his sanity and converted back to his radical beliefs. Once again the Crusader, he targeted the Emir of Ghulistan who was to pay a visit to the United States. (Avengers Spotlight#39 (fb) - BTS) - On his way to the airport to assassinate the Emir of Ghulistan an ongoing robbery in a local church caught the Crusader's eye. The Crusader swooped in and mutilated and killed the two robbers. Mistaken for the Cruader, the Black Knight (Dane Whitman) was taken into police custody. When Arthur's wife Eleanor learned of the murders and that the Avenger was apprehended, she came forward to inform the Black Knight of her husband's growing mental instability. (Avengers Spotlight#39) - That following day, the Crusader arrived in Washington D.C. and attacked the Emir, calling him the "Saracen". Luckily for the Emir the Black Knight intervened. Quickly gaining the upper hand in combat the Crusader was finally stopped when his stepdaughter Jenny stepped in. Seeing her shocked Arthur back to reality. Horrified by the idea he could have killed his stepdaughter, he threw his sword against his shield, shattering both and surrendered to the local authorities. (New Avengers: Most Wanted Files - BTS) - Imprisonment caused Blackwood's already fragile mental state te deteriorate even further. He eventually escaped confinement. (Infinity Crusade#1 - BTS) - The Goddess used the power of the Cosmic Egg to root out all violent and evil urges across the universe. This caused hardened criminals to reform, armed conflicts to stop and even briefly made sinners seek repentance. (Cage I#17 - BTS) - Like so many others, the Crusader was also affected by the Goddess' powers. Arthur felt a divine inspiration that renewed his belief and righteous power. Thinking himself to be a holy crusader, he decided to once again use his powers for his goals. (Cage I#17) - The Crusader appeared in Chicago's Canindelein Cemetery, where he murdered three vandals (though they were also under the Goddess' influence, cleaning and restoring the mess they made). He then decided to visit the offices of the Chicago Spectator to force the paper to promote his brand of faith to further his crusade. Driving towards the paper on a motorcycle, he accidentally ran into Luke Cage who also had a beef with the same newspaper. As the two super powered individuals went into combat, Luke easily managed to break the Crusader's sword, but even with a single, small piece of his sword left he kept on fighting. The Crusader was finally defeated by Cage as his power diminished, possibly due to being influenced by the large crowd of onlookers who cheered for Cage and called the Crusader a heretic. (X-Man#48) - Arthur retreated to an Irish monastery where he lived in seclusion in an attempt to avoid all modern life and find peace. Despite this, Arthur came upon some copies of the Daily Bugle that ran stories on a mutant faith healer Nate Grey (X-Man), calling him "the second coming". The highly unstable Arthur grew enraged by this and called out to his ancestors yelling his eyes had been closed for too long. Just then, lightning struck Arthur and magically transformed him back into the Crusader. As the Crusader, he travelled to London to confront Nate Grey, nearly killing him in combat. Grey was saved by a random bystander who reminded Arthur of his stepdaughter Jenny. After seeing the girl, Arthur came to his senses and surrendered to the local authorities. 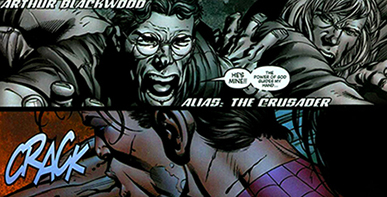 (New Avengers: Most Wanted Files - BTS) - Blackwood was eventually turned over to SHIELD who imprisoned him in the Raft. (New Avengers I#1 - BTS) - During the massive breakout staged by Electro, the Crusader was one of the 46 super powered criminals who managed to escape from their cells. (New Avengers I#2) - While on his way out, the Crusader and a bunch of other criminals encountered Spider-Man who they relentlessly beat up until Captain America intervened. 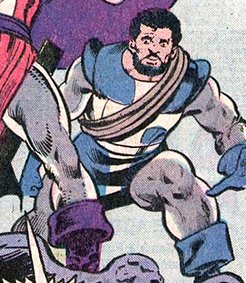 (New Avengers I#4 - BTS) - The newly formed Avengers counted the Crusader as one of the 46 escaped prisoners. (New Avengers I#7 (fb) - BTS) - After his escape the Crusader sought out the home of Dr Strange, calling it the "pagan den of devil worship". 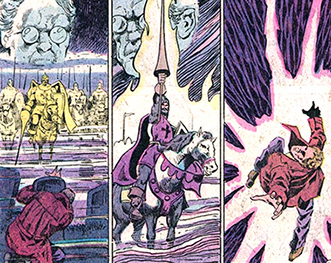 Dr Strange defeated the Crusader with some transient spells and banished him to an unknown location. (Wolverine III#42) - The Crusader, still active, organized a religious group of thugs for himself. While on a hijacked airplane he planned to bomb several hero headquarters. But he and his men were stopped by Wolverine after he found out about their operation. 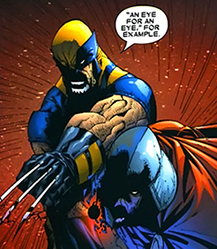 During the fight, the Crusader wouldn't stop quoting Bible scriptures much to Wolverine's annoyance as he then managed to claw out the Crusader's right eye, while quoting the Bible with "An eye for an eye". Just then the plane crashed into a cornfield and exploded on impact. 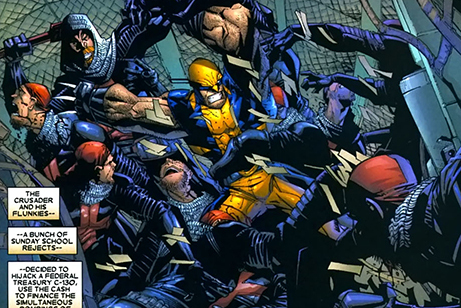 Although Wolverine survived the crash the Crusader's henchmen probably weren't so lucky. (Official Handbook of the Marvel Universe A-Z HC#3) - The Crusader didn't accept the Hood's invitation. Comments: Created by Alan Zelenetz (writer), Bob Hall (writer, pencils), Vince Colletta (inks). 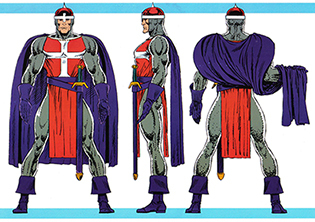 The Crusador received profiles in the following handbooks: Official Handbook of the Marvel Universe I#3 (1983), Official Handbook of the Marvel Universe II#3 (1986), Official Handbook of the Marvel Universe Master Edition #30 (1993), Thor: The Legend (1996), New Avengers Most Wanted Files (2005), Official Handbook of the Marvel Universe A-Z HC#3 (2008). Polowski worked as gravedigger at a cemetery in Chicago where he met Arthur Blackwood who asked Polowski to grant him access to the cemetery to visit his family crypt before leaving the city. As Blackwood was experiencing a religious vision, Polowski did notice some strange lights from the tomb. When Blackwood's religious vision subsided, Polowski discovered the knight's attire including a sword, shield, helmet and armor that had magically appeared out of nowhere. As Arthur picked up the sword he decided to use his new might to become a true crusader raising his sword against the pagan god Thor, appointing Mr. Polowski his new squire calling him Peleus. Blackwood, now calling himself the Crusader attacked Thor in downtown Chicago where Thor was about to receive the key to the city. Peleus' only action was helping the Crusader get down from a building and watching on as the Crusader defeated Thor in combat. Before the Crusader could kill Thor he was rescued by the Lady Sif who returned Thor to Asgard. The Crusader and his squire walked away, since the police was too afraid to intervene. At dawn, Thor returned at full strength and defeated the Crusader. Polowski and Blackwood fled the scene, filled with doubts about their cause. Polowski decided to take the Crusader to the emergency room and planned to beg the cemetery for his old job back. On orders of the Crusader, his gang managed to hijack a federal treasury C-130 airplane to use in the planned bombings of several hero headquarters. But when Wolverine found out about this, he boarded the plane and attacked the Crusader's gang. After dealing with the Crusader himself, the airplane crashed into a cornfield and exploded on impact. Although Wolverine and the Crusader survived the crash, the latter's henchmen most likely were not so lucky.